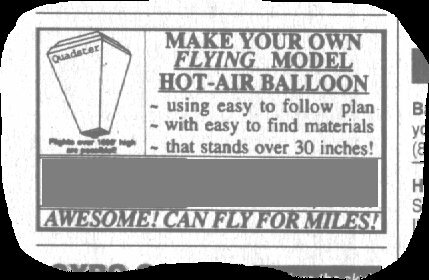 Want to make your very own hot-air balloon? You can and for just pennies a piece to build and fly. I've created an easy to follow set of plans that almost anyone can use to build their own graceful flying balloon. This balloon stands over 30 inches tall and, with the right conditions, and a properly built ballon, can fly over 1000 feet high and cover over 2 miles!!! I've also included plans for a much smaller balloon called the Hopper. It is for the beginner and can fly up to 75 feet high and 100' long!! I was charging over $12 dollars for these plans but I am now offering it for only $10 US. Please read my DISCLAIMER AT THE BOTTOM OF THIS PAGE AND ORDER NOW! BY PURCHASING THIS INFORMATION AND PLANS FROM JIM BARNES, PURCHASER AGREES NOT TO HOLD JIM BARNES LIABLE FOR ANY DAMAGES OR INJURY ARISING OUT OF THE USE OR MISUSE OF THE INFORMATION AND PLANS PROVIDED.